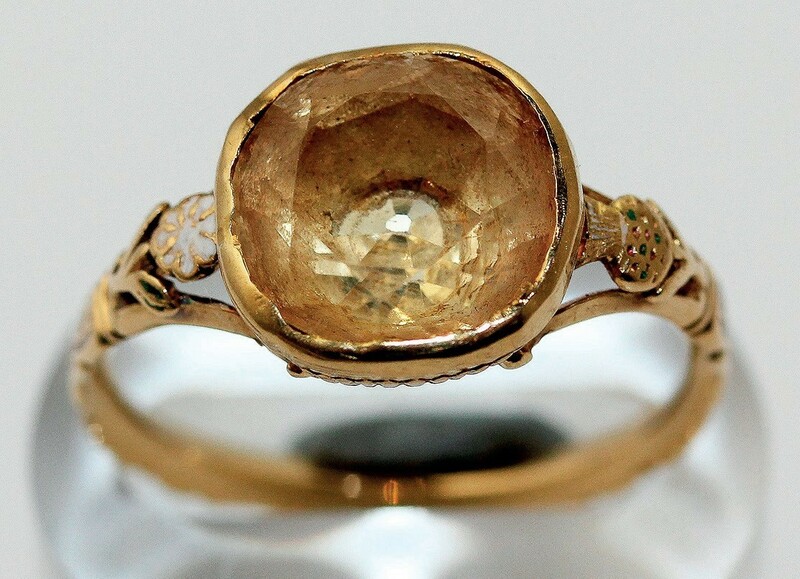 A gold, white enamel and citrine mourning ring with an inscribtion relating to Dr Archibald Cameron – £5400 at Henry Adams. Key to its appeal outside the jewellery collecting community was the inscription Dr Archibald Cameron Ob 7 June 1753 Aet 47. Cameron, whose father had participated in the failed 1715 Jacobite rising, was a prominent leader in the rebellion of 1745. He first saw action during an attack on Ruthven Barracks in late August 1745, sustained minor wounds at the Battle of Falkirk the following January and suffered two broken ankles at Culloden. In exile in France, Cameron remained in the service of the Bonnie Prince but in 1753, back in Scotland to plot the assassination of George II, he was betrayed by Alastair MacDonnell (the notorious spy Pickle) and taken to Tower Hill. On June 7, 1753, he became the last Jacobite to be executed for high treason. This memento of the great romantic cause, completed with thistle picked out in enamel, sold at £5400, some ten times the estimate. The auction took place on January 16 and the buyer’s premium was 20%.